Have you ever washed someone’s feet? Have you ever poured water over someone’s soles, felt the callouses on their heels, dried their feet with a clean towel? Have you ever put your shoes on after someone else has washed your feet? 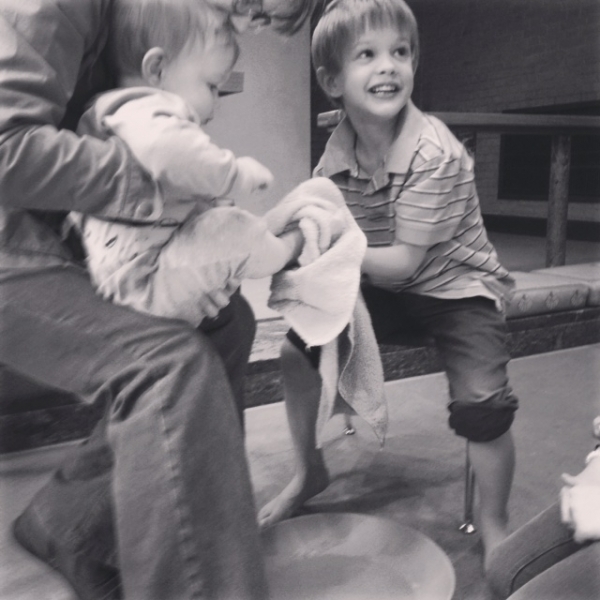 On Maundy Thursday, we were invited to come up as a family and wash each other’s feet. Nervous shuffling ensued. The kids went first, gentle and uncertain. Then Maile and I. It’s a strangely intimate experience. There’s a tenderness there, and barriers are lowered, barriers that you aren’t aware you even have as you go about your normal life. But when you take off your shoes and someone handles your feet, your stinky, dirty feet, I don’t know. Walls come down. I looked over as my five-year-old son Sammy washed the feet of his younger brother, nine-month-old Leo. Sam was so eager, and he grinned the entire time, spilling the water, looking up at us for approval, looking up at us to make sure he was doing it right. On the wall behind him, a painting of the crucifixion. If I do not wash you, you have no share with me. Kindness, so often seen as weak or insufficient, is sorely missing from the Christian community in this country. We insist on our rights…to own guns, to have one’s opinion heard, to refuse service, to retaliate. We demand to have what’s coming to us! What’s rightfully ours! But the voices we use to fight for our own rights are too often louder than the voices we use to speak on behalf of the hurt and suffering people. Those whose voices are overlooked. Those who need us to speak on their behalf. What I see in that beautiful passage where Jesus washes the feet of his disciples is a kindness that is blind to its own rights, a kindness that serves first, a kindness that makes less of oneself in order to bring down the barriers between individuals. Jesus had every right in the world to ask his disciples to wash his feet, and they would have fought each other for the honor. But he didn’t ask them to wash his feet. He asked them to let him wash their feet. Believe me when I say that my little son Sammy is the king of demanding his rights – he has to be. He is number four of five and would probably be overlooked a lot if he did not speak with a loud voice. But what I saw in his eyes when he washed his younger brother’s feet was a beautiful timidity, a soft kindness, and an eagerness to serve. Somehow, we need to rediscover this. Kindness needs to be resurrected here, in all of us. Great article, Shawn! Love being able to peer into your family’s life. So many life lessons in our daily lives. Absolutely lovely, Shawn. So true, so important. Thank you. I love this story. I love your observation of Sammy’s face as he washed his brother’s feet. Seeing it is wonderful, but a father’s description of what he sees in his son brings such depth and beauty to the picture. It is the picture of how God sees us as we serve each other. He sees the beauty in our actions and desires. Thanks for the beautiful word picture.